Came to South Africa in 1967. Studied - 1970: one year at Muchaelis School; 1971 - 74: accepted for specialized training in printmakeing at Jan van Eyck Akademie, Maastricht, Netherlands. 1975: on return to SA, interested in anthropology and began studies for BA at UNISA; taught part-time at Michaelis. 1976-78: appointed Principle at Rorke's Drift (ELC Art and Craft Centre); Kwazulu landscape and history provided source material for conceptualized translation in subsequent work; shift of interest away from academic studies back to printmaking. 1978: on retirement of Katrine Harries, invited to take over as Head of Printmaking Department at Michaelis School. 1980: One-man Exhibition at Stellenbosch University. 1981: Five Roses Young Artists Merit Award at Grahamstown Festival; invited exhibition of screen-prints at University of Wits Galleries. 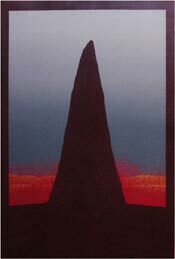 Although he had practiced professional for only a few years, the technical excellence and outstanding quality of his serigraphs of 1978-81 captured attention of museum Directors and exhibition selectors. Represented in SA National Gallery, Cape Town; Durban Art Gallery; University of Wits Gallery.